Although the animal mummies from the Manchester Museum were radiographed during the first phase of Rosalie David’s research in the 1970s, research specifically focusing on animal mummification began at Manchester in 2000, leading to the foundation of the Ancient Egyptian Animal Bio Bank in June 2010. The Bio Bank is a centralised data bank containing information and images (photographic and radiographic) on animal mummies held in museum collections around the world. To date, the Bio Bank contains records for over 800 votive mummies from 57 museums, and this number continues to grow. CT scanning a crocodile mummy. Mummy research at Manchester continues to favour non-invasive investigative techniques, beginning with a comprehensive photographic record and radiographic study with the help of our imaging partners – the Central Manchester NHS Trust and the Portland Hospital, London. All mummies, provided they are in a state suitable for transportation, are X-rayed and CT scanned to create an internal picture of each mummy. 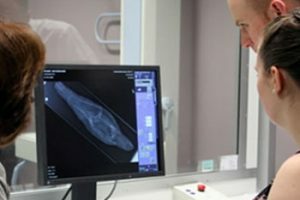 Around 330 animal mummies have been radiographed so far by the Bio Bank team, making this the largest cross-collection, cross-species study of its kind. Using digital radiography for a ‘first look’ at the contents of animal mummies. In some cases, clinical techniques prove inconclusive and it is necessary to conduct further analysis using industrial imaging (micro CT) or through the use of advanced visualisation techniques and 3D printing technology (McKnight et al. 2015b). 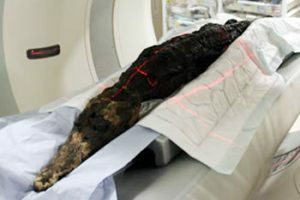 The application of clinical imaging remains invaluable in mummy studies; however, mummies are a diverse and unique group of artefacts and their study requires a great deal of expertise to obtain useful data. A pioneering protocol has been developed at Manchester for the study of mummified remains, which we hope will be used by other research groups in the future (McKnight et al. 2015). Anyone wishing to discuss this research or offer support should contact Professor Andrew Chamberlain (andrew.chamberlain@manchester.ac.uk) for further information on how to do so. Visit the Ancient Egyptian Animal Bio Bank website.